This 1000th heifer adds to an already strong ‘Irish herd’ now in Rwanda. The herd is multiplying every year as Bóthar returns with artificial-insemination straws from Ireland to put the cows back in calf. Bóthar has dispatched its first cargo of 2017, including its 1000th heifer, to Rwanda. 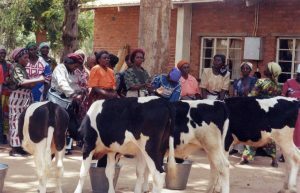 The Irish charity sends in-calf Irish heifers and other animals, donated by Irish farmers, to the African country which suffered genocide in 1994. Many of the donor farmers turned up at Roscrea Mart to see off their animals on Tuesday (24 January 2017) and were welcomed on behalf of Bóthar by Tipperary’s All-Ireland winning senior hurling manager Michael Ryan. “We live privileged lives here but there are people across the developing world who obviously don’t. I’ve been very struck by the impact Bóthar has on families,” said Michael Ryan, who is also a part-time farmer. It was a GAA double for Bóthar, as Dublin’s two-in-a-row winning football manager Jim Gavin was there three months ago when Bóthar sent out an airlift of animals to Rwanda for its 25th anniversary trip. This 1000th heifer adds to an already strong ‘Irish herd’ now in Rwanda. The herd is multiplying every year as Bóthar returns with artificial-insemination straws from Ireland to put the cows back in calf. The in-calf heifers are treasured in Rwanda, where agriculture is a leading industry. “Last October when we arrived there the Rwandan Minister for Agriculture Gerardine Mukeshimana was present to welcome us, as well as a troupe of traditional dancers. It was great to see just how much Rwandans appreciate this gift from Irish people,” said Bóthar CEO Dave Moloney. “We got out to the countryside to meet families who had received cows from us as many as seven years ago. It was heartening to see the difference this made to their lives,” he said. He described meeting a woman who had just lost her husband and two of her five children back in 2009. Bóthar gave her a cow, and from the proceeds of the sale of the calves and the milk, she was able to build a better house and put two of her remaining three children through second and third level education. 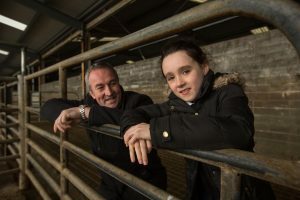 “You can still see the sadness in her but her life has become far less of a struggle thanks to that single Irish cow,” he said. The latest consignment was possible thanks to the generosity of farmer donors and members of the general public who supported the Christmas campaign, he said. Animals donated by Irish farmers are given to women widowed by the genocide in which between 800,000 and 1 million people were slaughtered in a 90-day period in a country slightly larger than the province of Munster. Last October, Bóthar sent its biggest ever cargo consignment to Rwanda as part of its 25th anniversary celebrations. The Bóthar ‘Ark’ plane took over 300 animals, including 37 in-calf dairy cows, 3 bulls, 160 pigs, 100 dairy goats and 5,000 chicks. 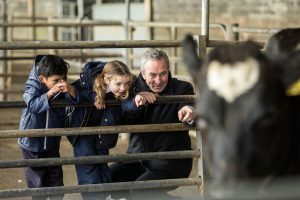 The animals help feed families who give their first-born female animal to a neighbour, and that neighbour does the same, so the gift of a single cow from Ireland multiplies over the years. While Bóthar receives donations of animals from Irish farmers, it fundraises to pay for shipping, housing and feeding the animals. It also trains the people to care for the animals once they arrive in their new homes in Africa, India and elsewhere. The first Bóthar flight left the same airport 25 years ago with a cargo of just 20 cows. It was intended as a one-off by a group of Mid-West farmers, among them legendary farm leader TJ Maher, as their way of marking the 300th anniversary of the Treaty of Limerick. A quarter of a century later, the charity continues its work. For more information on the work of Bóthar, see www.bothar.ie.